Back when I used to work as an aquatic life interpreter at UnderWater World we would get some really stupid questions and hear some amazing things out of people's mouths. If you've never been there, the aquarium is several million gallons and in 4 sections representing different habitats. Back then they were called, Minnesota Lake, Mississippi River, Gulf of Mexico and Caribbean Reef. The idea was that you traveled south from a lake to the river to the gulf to the reef. They changed this after I left mostly because they wanted to add new species of sharks into the large "gulf" tank and some of those species don't live in the gulf. Same for the reef, they wanted to add non-Caribbean species so the names changed. 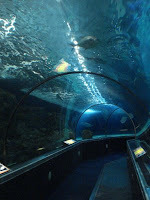 Visitors move through the aquarium through a clear domed walkway and are surrounded by fish. We used to say it was like scuba diving without getting wet. The left side of the tunnel is a moving walkway while the right is non-moving in case you want to step off and watch the fish more. We once had a guy get about 3/4th of the way through before he had a sudden realization and said out loud, "Oh, I'm moving." No genius, you are standing still and we're rotating a 1.2 million gallon aquarium around you. One of the questions we incredibly used to get all the time was, "Are these fish real?" Apparently a lot of people thought they were robots or something. I always thought it was a pretty stupid question but apparently researchers with Essex University are now working on robotic fish. The robots are like the roomba vacuum I have at home in that are autonomous. The idea is to equip them with sensors to detect pollution. The fish could swim around along pipelines looking for leaks. Let's just hope they are unlike my roomba in two important ways. 2) They don't get stuck on pretty much anything in their way. Plus two or more Roombas in the same room the same time is like battle of the Borg. I wonder what the robot fish would do. I'm Rosie Argento and why is my name on this page? If you did not mean to release the rights to this photo or if it has been incorrectly attributed to you please let me know and I would be happy to take it down. no problem. just confused because the photo wouldn't appear on my laptop. thank you.